Below is a list of available classes, descriptions, and prices. All these classes can be teach at your venue, event, or private party(minumin of 4 students). I am also open to ideas and willing to tailor the classes to your unique venue. If you are interest in any of the followoing classes please email for available date, more information, or any que3stions. Experiment with the bright colors of Alcohol Ink! Using Alcohol ink to decorate One Habotai 8mm - 8" x 54" 100% Silk scarf. Using the dry on dry to add details. You will be sent home with a print of how to set and care for your hand painted scarf. Work quick, that's okay. Additional scarves will be available for purchase at $10 each. Decorate a pre-cut guard bowl, using the alcohol ink marbling method. Once dry, you will choose to stencil or free hand a design on to the front of your bowl using the dry on dry method and detailing. 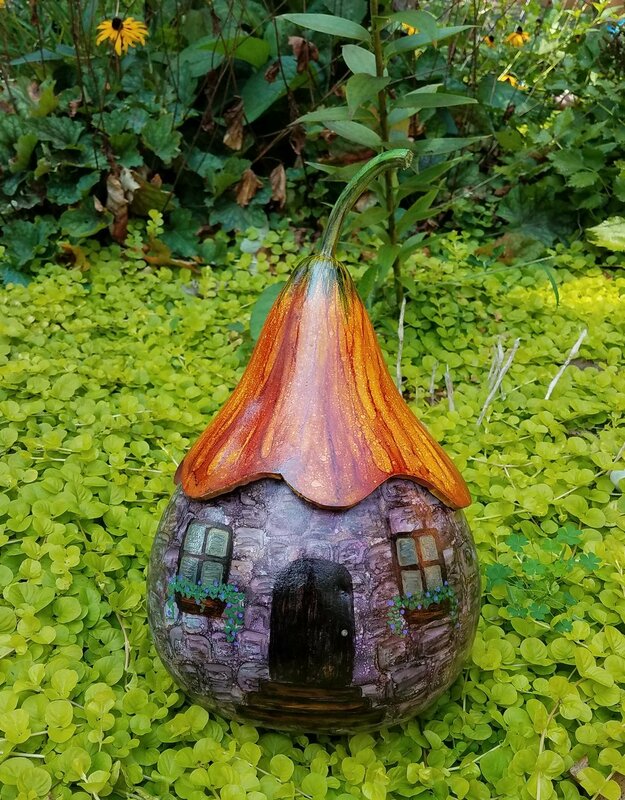 Come create your own fairy gourd house, complete with a flower roof and faux finish stone house. Use drips and brush strokes to texture the underside of a flower, then make a stone faux finish stamp. Next step is adding the detail windows, door and tiny window boxes with the dry on dry method. Class 1 You will learn to play with Alcohol Ink on Yupo paper. You recieve 2 pieces of yupo paper and 2 pendents with chains with the purchase of the class. 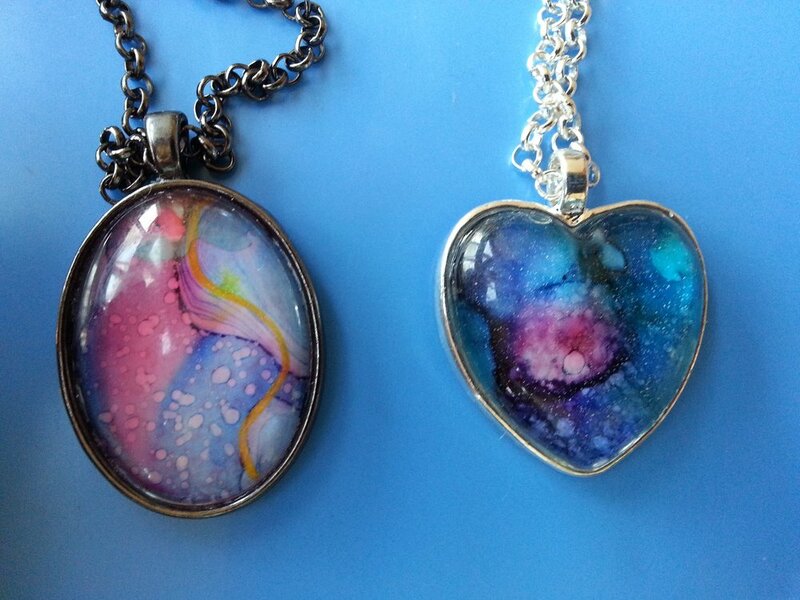 Additional Pendents will be available for $5 cash each. You can choose from baby gourd and/or cut pieces from gourd (your own design or using templates). Decorate using alcohol ink and design details with a gel pen or the dry on dry method. We will assemble the jewelry pieces making 3 pendents or an earring & necklace set. (Please note that the earring are fish hooks). Experiment with the bright colors of Alcohol Ink! Try different techniques of adding ink & alcohol to make your own abstract creation. I will also demonstrate my dream, sea, and tree scape technique. I will have Natural colored tile frames for sale for $5 a piece. Experiment with the bright colors of Alcohol Ink! Try different techniques of adding ink & alcohol to make your own abstract creation. I will also demonstrate tree scape technique. I will have Natural colored tile frames for sale for $5 a piece. Experiment with the bright colors of Alcohol Ink! Try different techniques of adding ink & alcohol to make your own abstract creation. I will also demonstrate Sea scape technique. I will have Natural colored tile frames for sale for $5 a piece. Experiment with the bright colors of Alcohol Ink! 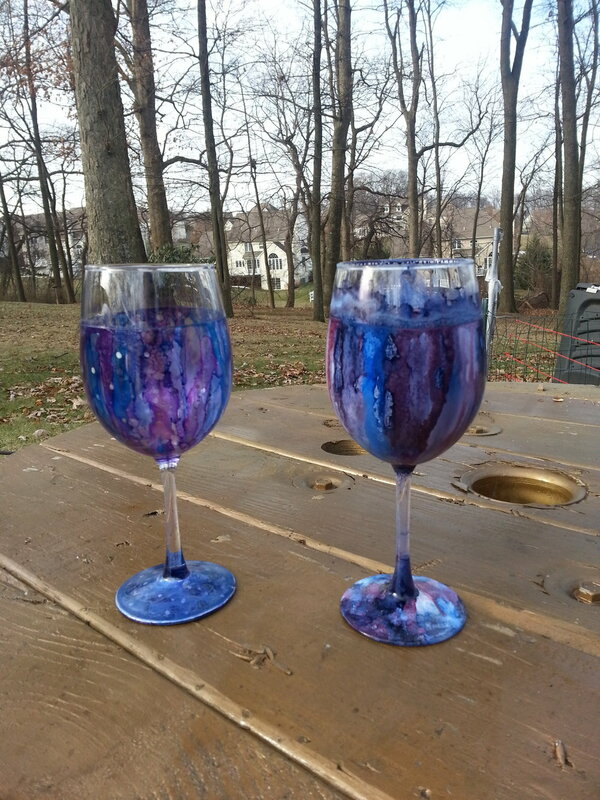 Using Alcohol ink to decorate your wine glass. Get a second, third or fourth glass at $5 each. 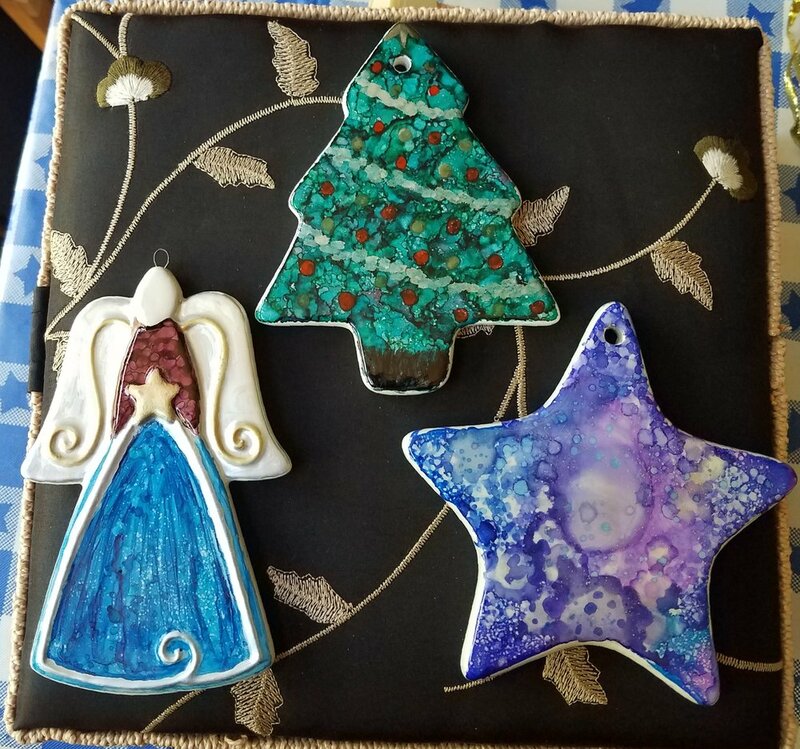 Use alcohol ink to decorate 2 ceramic ornaments. The class comes with your choice of 2 ornaments and $5 for each additional ornament. 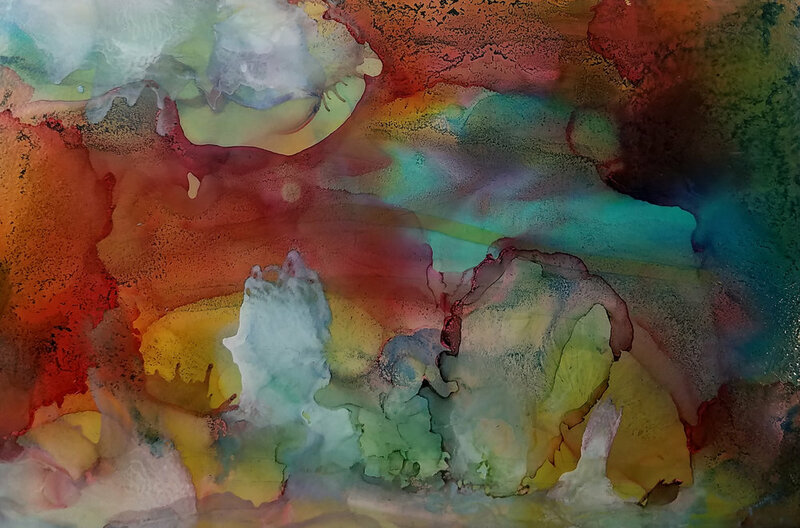 Experiment with the bright colors of Alcohol Ink on 2 Yupo Paper! Try different techniques of adding ink & alcohol to make your own abstract creation. I will have mats available for $5 a piece for your finished work of art. Students will be guided through the process of coloring their cannon ball gourd with Alcohol Inks. Holes will then be drilled around the rim and stone chips will be added as a rim treatment. You will choose your own colored stone chips from those provided by the instructor. Using Alcohol Ink create an Ombre Style gourd vessel. Using 2 shades for an Ombre style, or use 3 shades for a tie dye style. Paint and varnish your wooden buttons. Then embellish your vessel by drilling holes and adding wooden buttons in a pattern. Finish the piece by sealing with Krylon varnish spray. 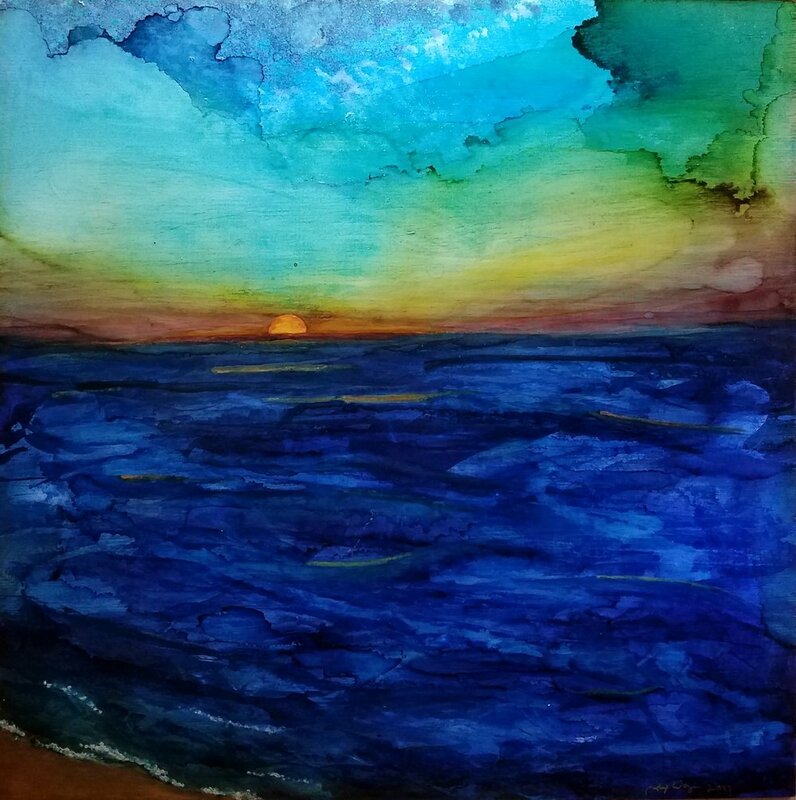 Alcohol inks are an acid-free, highly-pigmented, and fast drying medium to be used on non-porous surfaces. Mixing colors can create a vibrant marbled effect and the possibilities can only be limited by what you are willing to try. Get ready for the start of the fall season. Join us at the Cecil County Arts Council to decorate a pumpkin candy dish with Alcohol Ink. Bring your own wine & a friends and experiment with the bright colors of Alcohol Ink! Fill this pumpkin shaped candy dish with candy corn for the perfect autumn treat. This white porcelain box features handmade leaves and vines. It measures 6" x 4" .